Days out from the world’s biggest single-day elections and the polls in Indonesia show President Joko Widodo holding an almost unassailable lead over challenger Prabowo Subianto, in contrast to the surprisingly tight contest the same race became five years ago. In 2014, Widodo’s once commanding lead narrowed alarmingly, from 15 percentage points to only 2 or 3 points in the final month before the July election showdown as Prabowo applied the pressure and the Indonesian Democratic Party for Struggle (PDI-P) almost dropped the ball. In the end, the popular former Jakarta governor won comfortably enough by 53.1% to 46.9%, apparently benefiting from a late surge of undecided voters. The polls now show him at least 10 percentage points ahead and looking a lot more comfortable. With the presidential and legislative elections to be held on the same day (17 April) for the first time, Widodo has a hefty lead in both Central and East Java and is on even terms with Prabowo in West Java, the country’s most populous province which the challenger won by a substantial margin in 2014. 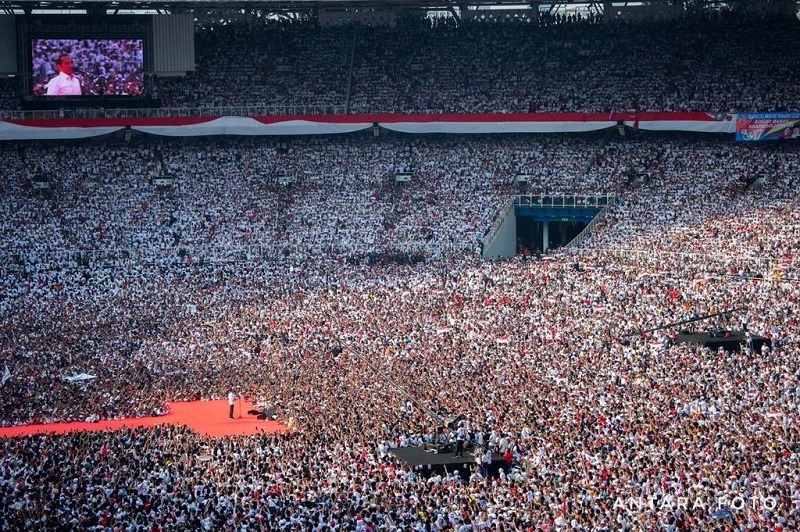 Java, containing 57% of the 193 million eligible voters, holds the key to any Indonesian election. According to the Kompas newspaper poll, the president and running mate Ma’ruf Amin enjoy a 51.3% to 34% advantage over Prabowo and his partner across the entire island, leaving 14.7% undecided. That alone should be enough to win him a second term in elections dominated by personalities more than policies. The other, less heavily populated, islands of Kalimantan, Nusa Tenggara, Maluku and Papua are all firmly in Widodo’s camp, but Sulawesi is a nail-biter and Prabowo has a healthy 50.5% to 37% lead over Widodo in Sumatra, where the plantation-based economy has been hit by low prices for palm oil and rubber. Outwardly, Prabowo and his campaign team remain upbeat and confident of somehow making up the difference. They say the mainstream media’s polls are not to be believed because voters think they’re actually being conducted by the police and military and are therefore not telling the truth. But this time around, Prabowo, 67, left much of the early campaigning to Sandiaga Uno, the personable, 49-year-old entrepreneur who was actually his fifth choice as running mate and is proving to be more attractive to women than the targeted snake people. Uno is also courting the conservative Muslim lobby, especially in West Java, where he made a point of visiting two large pesantren (boarding schools) which played a key role in the downfall of Jakarta’s Christian governor Basuki Purnama. During the recent vice-presidential debate, a deferential Uno bent over backwards not to embarrass Amin, the ageing cleric whose last-hour selection may well have arrested efforts to cast Widodo as un-Islamic but has done nothing to win him more votes. Campaigning has now passed the tail end of a final three-week period during which the National Election Commission (KPU) allows the two camps to hold large-scale rallies, but on schedules that ensure supporters from both sides won’t be in close proximity to one another. A three-day ‘quiet period’ is now underway. Despite the enormous logistical challenges in staging such massive elections, the four democratic-era polls so far have all been pulled off without serious incident and with only a minimum of irregularities, considering the scale of the events. That didn’t stop Prabowo from vainly challenging his defeat in the Constitutional Court in 2014 and with the opposition coalition already warning of alleged voter roll irregularities there are signs he will do so again if things turns out as expected. Most observers believe that Prabowo’s bigger priority is positioning his Great Indonesia Movement Party (Gerindra) for the next election in 2024, with Uno as a seemingly ready-made and seasoned candidate, but faced in the interim with the challenge of staying in the public eye. In the legislative election, Gerindra and the PDI-P appear to have sucked most of the oxygen out of the room, leaving many parties struggling to clear the 4% threshold required to qualify for representation in the newly expanded 575-seat parliament. Kompas has PDI-P polling at 26.9% and on track to win at least 150 seats, which would be its best showing since the first democratic elections in 1999 and due more to Widodo’s sizeable coat tails than the party’s poorly organised electoral machinery. Gerindra, boasting a stronger core of loyalists than any of the other 10 sitting parties, is in second place on 17%. Golkar trails on 9.4%, well adrift of its 14.7% showing in 2014 and the ambitious 18% target set by party chairman and industry minister Airlangga Hartarto. According to the latest surveys, ruling coalition partners United Development (PPP), National Democrat (Nasdem) and People’s Conscience (Hanura), and opposition party National Mandate (PAN), are all struggling to make the threshold. In a way, such an outcome would be historic. Golkar and PPP are the country’s two oldest parties, the latter the once formidable political machine of the late authoritarian ruler Suharto which was fortunate to survive the collapse of the New Order regime. PPP is in greater danger, following the recent arrest of party chairman Muchammad Romahurmuzly on corruption charges and a surge in the polls by the National Awakening Party (PKB), the other party which relies on the mass Muslim organisation Nahdlatgul Ulama for support. If those and four smaller parties fail to make the grade on election day, the seats they have won will be distributed among the successful parties according to calculations within each electorate and not as part of a national extrapolation. John McBeth is a Jakarta-based correspondent. This is an updated version of an article that first appeared in Asia Times. Image courtesy of Joko Widodo on Twitter.